My colleague Paul Beard was telling me about the Smith Center for the Performing Arts now in development in Las Vegas, and remarked that it was actually two entirely different creatures living in the same space. The day before it opens, it will be a construction site with one set of demands and challenges. The day after it opens, it will be a complex expressive enterprise with a whole different set of operating requirements. He likened it to an insect that enters a cocoon or chrysalis as one kind of animal, and departs as another kind. That transformation is part of what makes it so difficult for one leader and one staff to manage the construction phase successfully, and then transition into the expressive phase. It’s not only that they’re tired from the journey (although, usually they’re quite tired). It’s that the new animal requires different things than the previous one did…and very few people can deliver in both worlds. A larva has one job: eat (well, two: eat and don’t get eaten). It builds mass and stores energy for the transformation to come. Its body is structured to achieve those goals, and defend itself against predators. An adult transformational insect (Holometabola, if you really want to know) has a different job: procreate (and don’t get eaten before you do). Its structure and behavior are entirely different, because its goal is different. 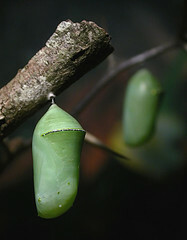 The pupa, that in-between stage in the cocoon or chrysalis, is tasked with the job of transforming, which takes rather focused energy and protected time to do. It struck me as we were talking that such transformation is not only true for large-scale cultural construction projects, but also for the daily life of a cultural manager. A theater space, for example, is a warehouse when it’s empty…a volume of space to be heated, maintained, sorted, protected, patrolled. Somewhere in the day, as show time approaches, it transforms into a preparation platform full of staff and stagehands, and by evening it’s a sanctuary, a collaborative environment, a social meaning machine. Each of those forms demands different kinds of attention and connection, even different kinds of people. But we don’t have the luxury of actually staffing for both, so the same people work in all worlds. We’re used to thinking that if we manage a creative space, it’s the same space throughout the day, the week, the month, the year. Or, if we have a defined job at an organization it’s essentially the same job when we arrive in the morning until when we leave at night. But even a moment of reflection will confirm that a single space is actually many spaces, wanting different things in each of its forms. And a single job is actually many jobs, demanding skills and abilities that are often conflicting or mutually exclusive during the course of a day. We need to discover and define what each moment requires of us, who it needs us to be and what it needs us to do. This will change throughout our day, our month, our season, our annual calendar, our work cycles. We need to give space and permission for our staff and ourselves to make the frequent transformations required of that world. Transformations require cocoons, even if only for a moment, and they require energy beyond what we expect. Where are the chrysalides in your calendar or daily schedule? When do you make time and space for you and your team to transform? This is a wonderful column and perfectly describes the different “hats” we have to wear, not only as arts leaders but also in our personal lives. Part of my day is spent as a family member, part as a flute player in a wind section, part as an artistic director of a summer festival, and part as the creator of a new class with you! We all have to find a healthy way to change roles numerous times a day, and changing from planning to action is a huge shift. Very much right on the mark. Having overseen the final completion of a building and then its use as a theatre, it’s as if both the manager and building go through a metamorphosis. Even more of a metamorphosis is required as we see changes in the art we present/produce and the way in which people engage that art. Such a good, thoughtful column, Andrew! As a self-represented concert artist and teacher, I very much identify with this situation. It is, I find, very important to recognize the necessary boundaries between these different demands on us and have the compassion to give ourselves a little time to change gears. At the same time, it’s critical to bring to our “left-brain” lives the imagination and passion that are fully present when we’re with our instruments. A challenging balancing act! There is a pattern of arts leaders “moving on” after a major construction project whether it’s from exhaustion, the transition needing different skill sets/experience, or from the unintended collateral damage resulting from getting the project completed (“value engineering” and other trying decisions). If this is withinn a college or university environment with its often complex maze of various stakeholders, the politics alone will drive out even the best arts executive. To improve the odds of this happening, I highly	recommend that a project is born and nurtured within a comprehensive and fully supported strategic plan under it. I agree…great post based on a wonderful metaphor, which of course could be applied to any endeavour…thanks Andrew!